Well hey there everybody! My registered name in The Jockey Club is Scout’s Honor, but you can call me Rascal. As you can/will see my name fits me well. I am “Mr. Personality”, but I am sure it won’t take you long to figure that out. I was born in 2002. Yes it is true, even though I do act quite mature for my age (well, when I am working). You would swear I was a seasoned veteran! 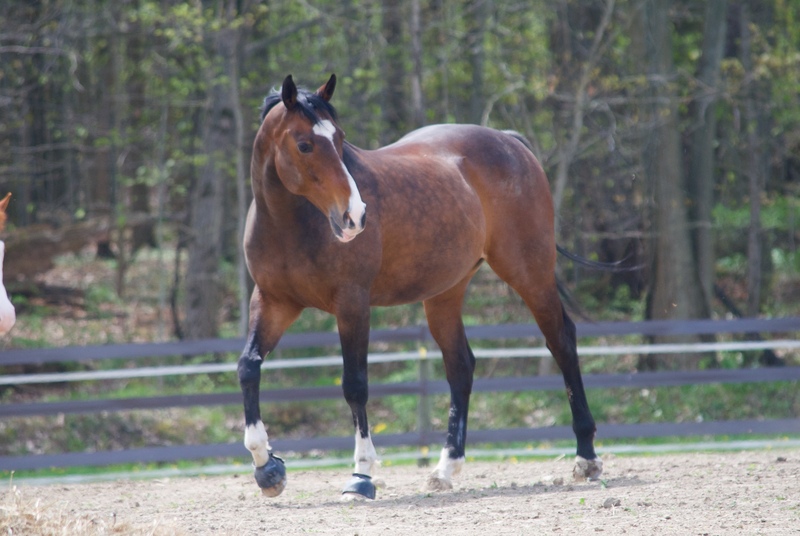 I am a bay, 15.2 hand Thoroughbred gelding. Oh, and did I mention I am very cute too! My mom and donor, Daryl Whitmoyer, thought that this would be the best place for me. I know it was very hard for her to give me up. But don’t worry mom, I love it here! I have lots of friends to play with and there are so many people giving me lots of attention. Just make sure you come and visit. I promise I will make you proud! Prior to arriving at Fieldstone Farm, I was shown in adult hunters. Due to an accident in the early part of 2007, I can no longer jump. That is okay; I still have lots of talent on the flat. I am a very laid back guy and consistent in the riding ring. I hope to teach a lot of younger riders, since I think my even, easy going temperament will help build their confidence. Now, on to more stuff about me! 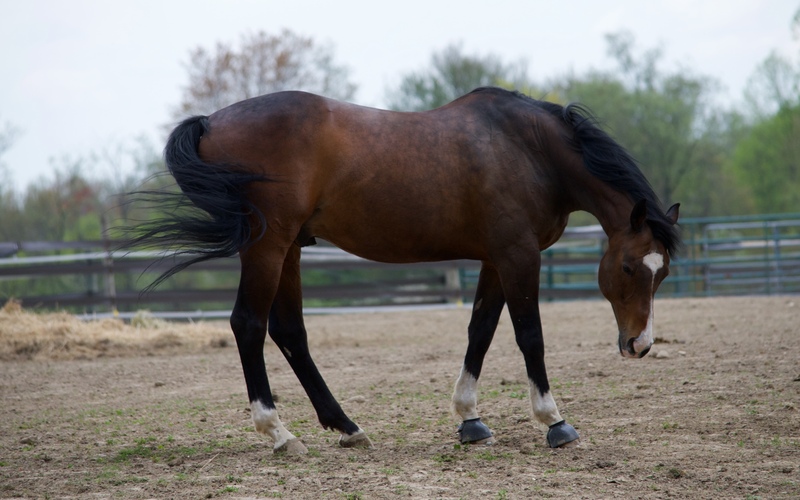 You will notice that I wear bell boots; they protect my heels and help keep my shoes on my hooves. I can play a little rough outside – that would be when my age really shows. I stand well for grooming, but please don’t curry real hard. Us sensitive Thoroughbreds can’t handle it. 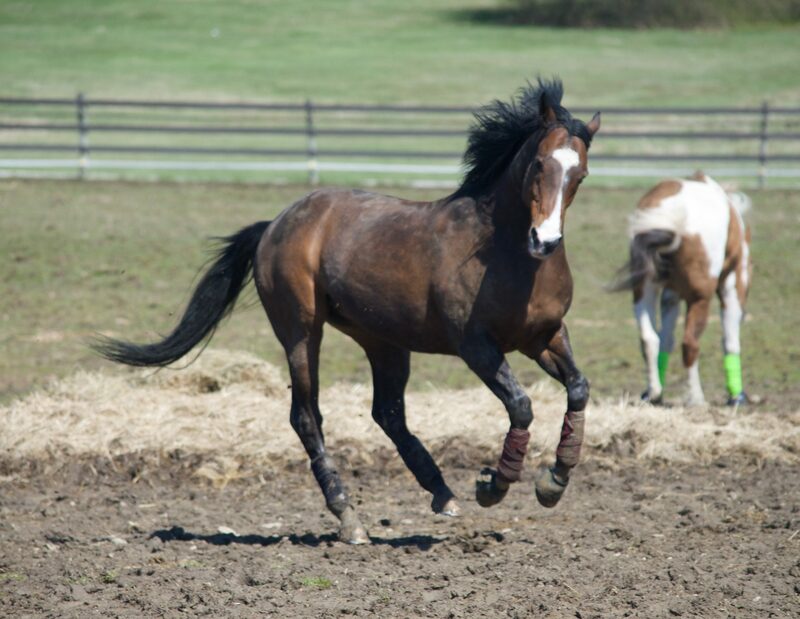 You may notice that I may act a little playful, like trying to chew my reins or lead line – just excited to be working. Please do not allow me to do this. One thing that I really do not like is to have rings, hats or anything else placed on my ears. I am fine with all the other stuff, but please don’t play with my ears (I guess you would call that a minor character flaw). I am fine to halter and bridle. You may notice I carry my head a little lower when working; it helps me carry myself correctly and use my back end properly. I may start out a little choppy at times at the trot until I get loosened up. One more thing, you may also notice from time to time a small haze in my left eye. Don’t worry, I can see everything just fine. I get a little inflammation/irritation in that eye. I am sure I will meet you all very soon! If you are strolling down the aisle and notice a wiggly nose coming thru the feed hole – it would be me saying hello! New news about me since being part of the team here. I have won several awards and don’t worry it hasn’t gone to my head…yet. Just kidding. In 2013, I won the Thoroughbred of the Year Award thru the Jockey Club. Then in May 2014, I won Smartpak’s horse of the month. Clearly everyone can see my natural born talent. Then to top it all off, I won Region 4’s award thru PATH, the Therapy Horse of the Year Award. I am really making my mark and so happy to be a part of this team that made it all happen. Thanks everyone for the support!